Built in 1903 as the country estate and gentlemen’s cattle farm of John Henry Strongman, one of the founders of the famed F.W. Woolworth five-and-dime empire, the sprawling estate has had many lives–and almost as many peaks and valleys as northeast Pennsylvania’s mountains. Strongman erected the grand Gatsby Mansion on the original site of his parent’s modest farm house. He was one of eight children of immigrants from England who settled here and became farmers instead of laborers. John Henry hired architect Charles Arthur, from nearby Dyberry, to bring his two-story vision to life. Upon completion, the site was named “Bethany Homestead Farms,” and farming included dairy, poultry and developing Guernsey herds for sale. John Henry Strongman was one of the first men to join F.W. Woolworth in his lucrative chain store venture. During the ‘20s, Strongman expanded his Bethany estate with the purchase of seven farms and several additional parcels of land. At its peak, the estate totaled almost 1,000 acres, including an executive nine-hole golf course. When Mr. Strongman died in 1932, the estate was valued at more than $2 million dollars. Mr. and Mrs. Byron DeWitt Miller took over the estate; she being Hortense Strongman, daughter of Mr. John Henry Strongman. In 1910, Hortense had married Miller, who was a founder of F.W. Woolworth, Ltd. in England. They returned from England in 1920, and Mr. Miller became president of the Woolworth parent company in the States. The Millers took the Mansion to new heights, adding a third-floor addition for her parents to enjoy when they weren’t spending most of their time in Miami. The Millers, meanwhile, kept a regular residence in New York City and used the Bethany Mansion as their summer house. Mrs. Miller hired gardener Cecil Stanbridge, from England, to design the estate’s formal gardens, which included the wisteria-covered arbor–still a magical place–and a potting shed with an extensive greenhouse. The potting shed remains intact across from the carriage house, but the greenhouses were dismantled in the late ‘80s. The Millers also added to the Play House building, which was at first mostly a gymnasium with other recreational facilities to be added. From the beginning, the Strongmans made the building available to the community for benefits, card games, teas and other events. Mrs. Miller remodeled and expanded the Play House in 1933, adding the Olympic-sized pool and the stage, where the famous actress Cornellia Otis Skinner performed many times, along with many locals who today fondly remember their day in the spotlight. Mr. Byron DeWitt Miller died in 1960 having been separated from his wife for several years. Mrs. Miller died the following year at age 87. During her life she was known for her philanthropy, not only in Bethany, where she helped to found the Women’s Club and built the Bethany Park and library, but also in England, where she volunteered during World War I, and in Miami, where she owned a gorgeous mansion and hosted numerous charitable events, especially her highly anticipated fashion shows. Upon her death, she bequeathed Bethany Homestead Farms and all her other real estate assets to her son Byron Strongman Miller. After Byron Strongman Miller took ownership of the estate in 1961, he phased out the farm operations and agreed to sell the site in 1964 to William H. Wilson of Hasbrouck Heights, New Jersey. At that time, Mr. Wilson announced that he and his associates intended to establish several enterprises on the property—all related to a resort type of development that included the conversion of the Mansion into a first-class restaurant. There were several elegant dining rooms, including The Colony Room, Oak Room, Terrace Room, Oval Room and Mirror Room. 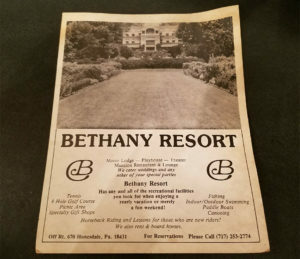 Succeeding Mr. Wilson and his associates in the operation of the Bethany property was Bethany Lodge, Inc., a company formed in 1967 and headed by a local, Grant Irwin of Honesdale. In the ensuing few years, Bethany Lodge made a number of improvements to the property, including a 30-unit motel, which is now Bethany Village, the assisted living facility down the hill from The Mansion at Noble Lane. In June, 1978, Mr. Samuel Valenti and his wife, Tina, of Exeter, PA, acquired the estate and renamed it Playhouse Resort and Country Club. In January, 1982, Dale Wheeler of Massachusetts became the major shareholder of Playhouse Resort and Country Club. During this time, the condo, now an abandoned shell overlooking the lake was built. After Mr. Wheeler’s failed turn at trying to run a successful resort at the estate, the Mansion became abandoned and in disrepair—the perfect location for a ‘80s teen flick from Bob and Harvey Weinstein about a group of recent high school grads from New York City who cook up a scheme to turn a dilapidated and haunted hotel in the mountains, inherited by one of the youth, into a rock-n-roll hotel, complete with a Mick Jagger Suite. The Hollywood film features a young Hal Holden and a budding star–Marisa Tomei. In 1987, after several years of neglect, the Mansion and its surrounding buildings and land got a new owner in the form of Bethany Associates, a group of professionals from New York City who invested nearly $7 million dollars on extensive renovations, including restoration of the Mansion, modernization of the Recreational Building, elaborate landscaping, and reconstruction and expansion of what had been the motel, which they used as the Residence Building for the treatment facility. Eleven months from inception, the new facility opened but closed three years later, with staff citing that insurance companies’ unwillingness to cover inpatient treatment made it a struggle from day one to bring in the money to meet their financial obligations. 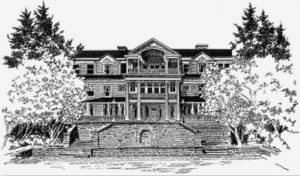 The Bethany Borough Council denied the plan for an outfit called YSI, Inc., to buy the estate to house and prepare troubled foster care youth for life, but in 1998, Majestic Mountains, a group of local health care professionals, got the green light to purchase the deteriorating estate for its six-phase, Senior Living Community development plan. Phase I was to renovate the former Rehab Center’s Residence Building for assisted living senior housing. Majestic Mountains has successfully run one of the best assisted living facilities in Wayne County for 14 years, and while they didn’t execute the other phases of their project, they tried to keep the Mansion and other structures stable until they subdivided the lot and sold the Mansion, Recreational Building, Carriage House and 20+ acres of land in 2011 to Monique Greenwood and her husband Glenn Pogue of Brooklyn, New York.